Geneva/Ougadougou, 13 March 2017 - On 7 March 2017, at the Triple Point in the heart of Park W, where the territories of Benin, Niger and Burkina Faso meet, the General Directors of the wildlife management agencies from each of the three countries signed an agreement to strengthen collaboration in wildlife law enforcement in this critical wildlife area. 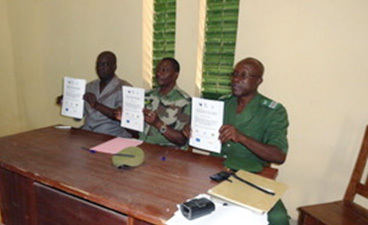 This effectively gives the ‘green light’ to initiate activities designed under a major CITES initiative to build law enforcement capacity, strengthen the integrated management of the transboundary area, and enhance the protection of what is widely considered the most important area for wildlife in West Africa, including due to its 8,900 elephants. The activities to be implemented under the agreement were defined late last year at a meeting that brought together senior management and area wardens from the five protected areas in the three countries that make up the W-Arly-Pendjari Protected Area Complex (WAP). This targeted intervention, which is expected to last into 2019, is funded by the European Union through the CITES Minimizing the Illegal Killing of Elephants and other Endangered Species (MIKES) project, and is being implemented in partnership with the IUCN Regional Office in Burkina Faso. MIKES is a project of the ACP group of States, supported by the EC through the 10th EDF, and implemented by the CITES secretariat. The WAP was selected as one of the 8 "Focal Sites" under the MIKES project where support for wildlife law enforcement capacity building is most needed. The areas were prioritized based on detailed assessments of existing law enforcement capacity, as well as on their importance for elephant conservation, the co-occurrence of other key CITES-listed species, and the level of poaching and other threats impacting each site. In each site specific packages of activities have been developed to ensure that the support addresses the unique issues in each area. Activities will be implemented in five protected areas that make up the WAP: Park W (Benin, Burkina Faso and Niger), Pendjari National Park (Benin) and Arly National Park (Burkina Faso). Activities will focus on: strengthening patrol staff capacity and performance throughout the area; improving law enforcement management, including communications within and between the protected areas; increasing the contribution of intelligence to wildlife law enforcement; and enhancing community and interagency collaboration and support for wildlife law enforcement operations. The European Union continuously invested in the WAP since 2001 with the European Development Fund (EDF) through two programmes on the regional investment fund: ECOPAS in the Parc W from 2001 to 2008, and PAPE in the WAP from 2011 to 2016 (in addition to the support provided through MIKES). At the 17th meeting of the Conference of the Parties to CITES (CoP17), held in Johannesburg in September/October 2016, the CITES Secretariat was asked to work with its partners in the delivery of activities that focus on wildlife crime enforcement support in countries in Central and West Africa. See Decisions 17.97-17.100. 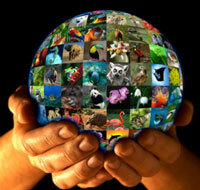 With 183 Parties, CITES remains one of the world's most powerful tools for biodiversity conservation through the regulation of trade in wild fauna and flora. Thousands of species are internationally traded and used by people in their daily lives for food, housing, health care, ecotourism, cosmetics or fashion.